Film Institute in India: Pre Production - What happens in the Film Industry? The pre production stage is the foundation or root for any film. More the time spent and good the pre production of a film is, more smoother and organized is the production and post production of any film. 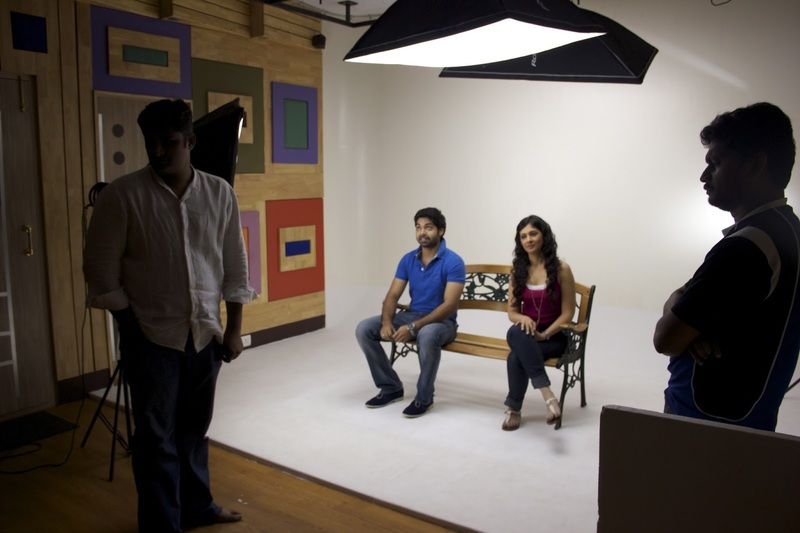 What we have furnished below, is based on the pre production for the Tamil feature film "Oru Modhal Oru Kadhal" (OMOK) , Written & Directed by Keerthi Kumar, the Founder and Director of Flash Frame Visuals Academy of Film & Television, Bangalore. The film is scheduled to hit the theaters by the end of 2013. 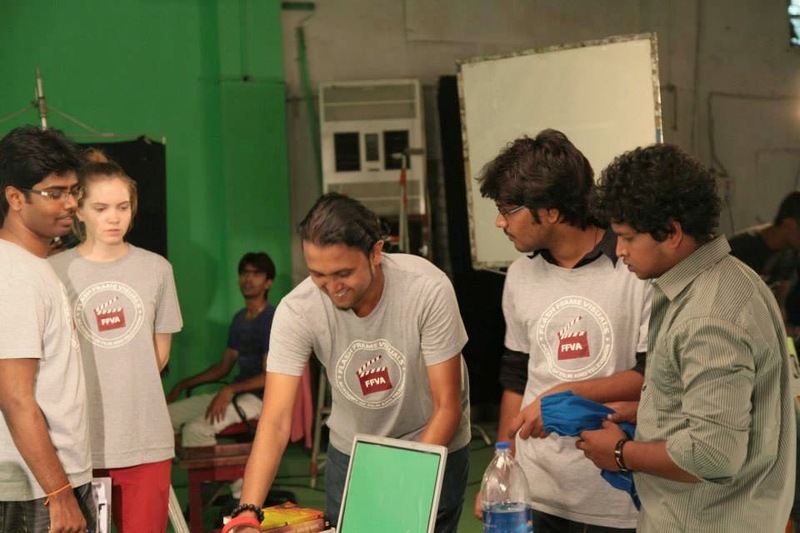 2012-13 Filmmaking students of Flash Frame Visuals Academy of Film & Television were selected as assistant directors to work in the film. The students of FFVA, after getting Placements through the Film School, had a quality and sensible learning throughout the film. The below mentioned Pre production is a basic structure of how it happens for a medium budget, live action film in India. We have not explained in depth, since the level of execution differs from team to team. After the script of OMOK was finalized, producers were confirmed, contracts were signed and the pre production commenced. Based on the experience of the FFVA team, we have furnished the practical points below. 1) Idea - Story discussion The Director/Writer prepares the one line of the movie. One line indicates, description of each scene in few lines. Then the Director himself or the Dialogue writer starts with the dialogues. Based on this scenes are analyzed, criticized, developed, shaped.etc. by the Director, along with the assistant directors. Some Directors also have a "Screenplay Team" where a group of experts sit and develop the scenes, along with the assistant Directors. 2) Script - Prepare the bound script. Usually prepared by the Director and Writer or only the Director, if there is no writer. The bound script is the foundation and the base of the movie. Whatever happens after this, is based on the bound script. The Cinematographer and Assistant directors have a copy each, so that they can do homework, before sitting along with the Director and plan for the making. Its based on this bound script, the Director, Cinematographer and Asst.Directors guide the art director, costume designer and other technicians. 3) Cast & Crew - Cast and crew are identified. Assistant Directors maintain a cast list of the characters. Crew is mostly decided by the Director and producer. 4) Budget - After the cast and crew is finalized, based on the how much the production house can spend, budget sheet is prepared. Preparing and locking the budget takes few days or few weeks, depending on the production house. This task is done by the line producer/executive producer, with the help of production managers. 5) Scheduling - The entire plan of shoot is divided as schedules. One schedule will have continuous no of shooting days. So a movie is divided to "n" no of schedules. For example : OMOK shoot was finished in five schedules. Each schedule had seven days approximately. There is no particular rule, like - one schedule should have this no of days only. It depends on the team working style, availability of resources.etc. Schedule is made based on the artist dates and its the job of the team to combine other resources based on the dates. The above shown is the image of the initial schedule which was finalized for the shoot of OMOK. This schedule sheet was later divided in-depth into shooting schedule for costume dept, Art and also based on the cast. Each of this sub divided list/plan will be with the Assistant directors, who belong to the respective departments. The Director and Cinematographer sit with the core team members and finalize the schedules based on the above mentioned factors. After finalizing, they report to the Line producer. 6) Locations - Location scouting will start. One or two assistant directors will roam with production managers, take photos, show to the Director and Cinematographer. After they both visit, discuss and approve, the locations are finalized. 7) Costumes - Director, Cinematographer, asst Director of costume department, and the costume designer....all of them sit and decide the costumes for each scene. Assistant director and the costume designer show reference to Director and Cinematographer. Once finalized, purchase starts. The costumes are decided sensibly, based on the scene, mood of the scene, actors, message conveyed.etc. 8) Props - Any special properties required, Director informs the art director and member of the art department keep the properties ready. Illustrations are made if required. Again the Cinematographer works closely with the art director/production designer so that the properties used are in sync with the lighting setup and angles, decided by the Cinematographer. Also the costume designer and art director sit with the cinematographer, if their work is suitable for that scene and the mood. 9) Music (applicable only if songs are there..mostly indian films) - Meanwhile Director sits with the Music director who is a part of the crew. The music composing starts according to the situations explained by the Director. Basic tunes are formed and the recording starts. Since production also involves shooting of the songs, song composing is done during the pre production stage. Original background music happens in post production stage. 10) Photoshoot - for publicity stills. Stills used for posters and publicity. A professional photographer is hired and photoshoot is done. He is different from the still photographer who will be available in the shooting spot throughout. 11) Rehearsals (if required, but always better to do) - To be done by the actors. Director trains them. A kind of pre visualization. To save time in the spot. Final team discussion with all assistants and crew right before the shoot begins. The pre production involves contribution of the entire team of technicians. The Director's job is to identify the right talent, take suggestions, implement them in the right way and organize it with the help of the team. The bottom line is THE TEAMWORK! Gracefull Blog!! Filmmaking takes place in many places around the world in a range of economic, social, and political contexts, and using a variety of technologies and cinematic techniques. But it have vast scope in India. Because of this there are various Top Film Making Colleges in India. These colleges trains the students to make the films like blockbusters. 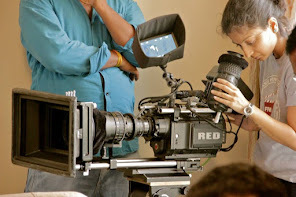 The Film Making Institutes in India are considered as the top institutes in the world for making. The video was awesome and great information on the blog. Thanks for sharing the information. I like the informative post the author shared here. Really wonderful information provided thanks for sharing the informative post.